The Lockheed Martin Astronautics facilities in Colorado are the location where some critical space launch vehicles and spacecraft are built. 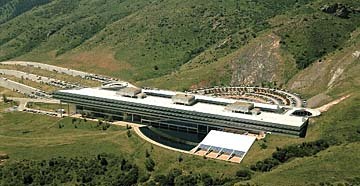 The Deer Creek facility (left) is one of the most beautiful corporate offices in the world. 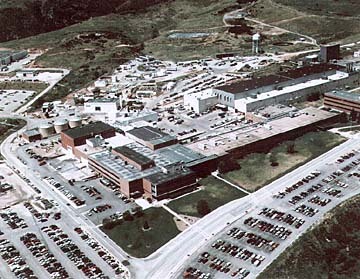 The original plant sight at Waterton, Colorado (below) was initially built in 1956 as one of the first ICBM production plants in the early days of the cold war. Today, both Titan and Atlas launch vehicles are built here as well as many different space vehicles and satellites. The technology capabilities of this Colorado company are truly incredible. I had the pleasure of working in these facilities for four years while an officer in the Air Force. There are some truly impressive people employed here and I truly believe this capability makes Colorado one of the strongest locations for space related technology. Go to the Lockheed Martin Astronautics web site. It includes more pictures and biographical data, not to mention company history and profiles. This is an Air Force owned Titan IV launch vehicle on the pad in Florida at Cape Canaveral Air Force Station. These are truly impressive launch vehicles used to launch what are usually classified payloads. If you want to know more about what the payload is, read some Tom Clancy books! This system works just the opposite of the space shuttle. The shuttle lights its liquid fueled engines first and ensures a good burn on those engines prior to lighting the solid rocket boosters. 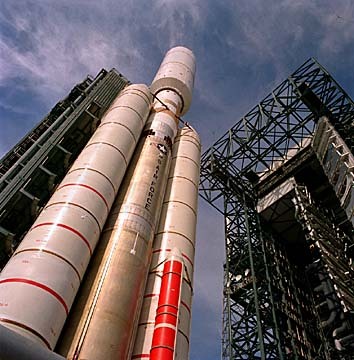 The Titan actually lights the solids first and lifts off with them, in essence using them as a first stage. The liquid fueled engines are lighted while the vehicle is in flight, propelling the payload into earth orbit. These vehicles are launched both from the Florida launch facilities and the west coast launch facilities at Vandenberg AFB in California. Vandenberg launches are due south into polar orbit, providing 100% coverage of the earth for the observation platforms they carry.